Today I have a special someone to introduce to you all! When I ran the inaugural session of Set Up Shop, I let it be known that I would be choosing one of my students to mentor for 3 months. When the course came to a close, I set about the tricky job of picking one person from my 75-strong class of wonderful women to work with one-on-one. It was a difficult decision, because so many of them are passionate, hard-working, dedicated, and giving. In the end, I made my choice… and today I am very pleased to introduce my new mentee to you all – the lovely Stacey from Max & Me Designs! Stacey makes wonderful and unique art from vintage postage stamps, as well as postage stamp jewellery and a few other bits and pieces. I am impressed by what she’s managed to achieve in the short time she’s been in business, and I reckon she’s just going to go from strength to strength. How did Max & Me Designs begin? Like many businesses in the handmade community, Max & Me Designs began by accident. I was cleaning out the cupboard in our new nursery/old junk room when I came across some stamps that I had collected as a child. After spending a few moments looking through the pages of the album and reminiscing about my childhood inspiration struck! I decided to use some of the stamps to create a piece of art for my new little baby boy, Max. I loved the idea that I could take something special from my own childhood and upcycle it into a keepsake gift for him. Little did I know that this very moment would set me on a path to creating my own business. Fast forward a year down the track and Max & Me Designs is now a successful small business featuring a unique range of art, jewellery and giftware which have been handcrafted using upcycled postage stamps from all over the world. I love being able to take something so small and insignificant as a postage stamp and reincarnate it into something truly beautiful and unique that will be treasured by its owner. Every piece is a one of a kind and I often have customers who buy them as keepsake gifts to celebrate birthdays, christenings, Christmas, wedding anniversaries (1st anniversary is paper), Mother’s Day, Father’s Day or the arrival of a new baby. What was the motivation for starting your business? Like many new mums I found the first few months of maternity leave very isolating. While I loved being at home with my new little baby I was used to talking to people all day long and being busy, busy, busy! Suddenly I was at home by myself and I missed the mental stimulation of working and being around people. Several of my friends had commented on Max’s artwork and suggested that I try selling the designs online. I figured I had nothing to lose and set up online shops on the Etsy and Made It sites. I also set up a Facebook page for Max & Me Designs which is where I discovered the AMAZING community of handmaidens! What has been your favourite part about the journey so far? My favourite part of running a handmade business would have to be connecting with so many new people. It’s been wonderful getting to know my customers, Facebook fans and fellow small business owners over the past year. I love interacting with my fans on Facebook and find it to be such a beautiful, supportive community. It’s due to their support, and that of my family and friends, that Max & Me Designs is where it is today. I have also met some very generous philatelists who have donated thousands and thousands of stamps! I have several people who regularly send me envelopes filled with exotic stamps from all over the world, including one lovely grandfather who regularly sends huge envelopes of stamps from his collection. I feel as though they are entrusting me with a part of their lives that is very important to them and I feel very honoured that they appreciate and value the designs that I create. What do you think the future holds for Max & Me Designs? Wow, this is the big question, thank goodness I have Jess to help me along the way! With Jess as my mentor and the very generous business grant from Renata at Forming Circles I’m hoping to take Max & Me Designs to the next level by further developing the product range and spreading the word far and wide. 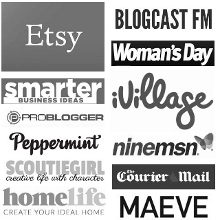 I would like to extend my social media networks and finally getting onto Twitter… I would also like to increase the number of retail outlets which carry my products and try my hand at some of the larger design markets in Melbourne and possibly interstate. The key thing that I have learnt from the past year is that anything is possible if you put your mind to it, after all what have you got to lose? P.S. Term 2 of Set Up Shop will run this July! I will, again, be choosing a student to mentor for 3 months. If you’re ready to craft an online business and shop that will rock your socks, make sure to sign up here to find out when registration opens.